Sweden’s Patrick Kittel held off a late challenge by home favourite Emile Faurie to secure an impressive victory in the FEI World Cup™ Dressage 2017-18 Western European League qualifier at Olympia in London. Kittel’s winning score of 80.635 has helped the Swede to a commanding lead in the overall standings, with qualification for theh finals in Paris edging ever closer. However, if Kittel had provided the icing on the cake by wowing the crowd at the iconic London arena, Faurie’s unexpected display was the cherry on the cake for the spectators at the festive showpiece, with Edward Gal of the Netherlands finishing third. Whilst Faurie is an experienced two-time Olympian, he has only been working with his Hanoverian stallion Delatio for a matter of months, and this FEI World Cup™ leg marked their first Grand Prix freestyle. Faurie showed off Delatio’s tremendous power and active hind end in thrilling extended trot and half-pass elements, as well as on-the-spot pirouettes with lots of jump and super straight tempi. Following a score of 80.405 at Olympia, this duo will only improve with time and will certainly be contenders heading into the New Year. Faurie’s display wrapped up a night of thrilling performances, with Kittel producing a sublime, crisp and clean programme with a high degree of difficulty to live up to his name as ‘The King of Freestyle’. Kittel’s 11-year-old Oldenburg gelding, Delauney Old, was particularly responsive for his age, executing clear transitions and exuberant canter work, but able to go straight into small, bouncy pirouettes. The pair stayed ‘right on’ with their music – a medley that including music from Guns N’ Roses and Wings – and after the final halt, Kittel was in a celebratory mood, blowing kisses to the crowd. Joining Kittel and Faurie on the Olympia podium was Gal, another master of dressage, who guided his Dutch Warmblood Glock’s Zonik to a score of 79.340. Gal, a two-time Olympian who won a team bronze in 2012, had the youngest horse in the freestyle competition. With a huge canter and terrific overtrack in his extended walk, Glock’s Zonik is a horse that likes to move out and yet showed tidy changes in Gal’s experienced hands. Fourth place went to Madeleine Witte-Vrees of the Netherlands (77.645), who is ranked 17th in the world for horse and rider combinations with her KWPN stallion Cennin – another young horse to watch. With expressive passage, good reach, high focus, and strong tempi work, this pair had a great week, with Witte-Vrees also claiming third place in the previous night’s Grand Prix test. Lara Butler of Great Britain received a final score of 76.985 for fifth place and the lead going in the judging break at the halfway point of the competition. A former Junior and Young Rider, Butler used rock and roll music to highlight her horse’s eagerness and finished with a 45-degree piaffe fan before her final halt. So solid were her tempi that not only did she perform them on a curved line but inserted them into her joker line as well, where many riders would have opted for something less challenging. Butler’s countryman Hayley Watson-Greaves took sixth place (76.685) – a further indication of her desire to represent Great Britain in Paris in the spring. After a terrific performance recently in Stuttgart, Watson-Greaves received high artistic marks at Olympia and her sleek black gelding Rubins Nite demonstrated beautiful reach with both his frame and legs, finishing movements elegantly and with superb self-carriage in a difficult programme. Great Britain had a wonderful showing on home ground with Richard Davison taking seventh place (75.655) on Bubblingh, a horse he bred himself from his own 2004 Olympic mount. Davison, a four-time Olympian and five-time World Cup participant, proved how experience and presence of mind in the ring can highlight the best of a developing horse. Finishing in the top eight was Katja Gevers of the Netherlands, who also finished in the top 10 last year at Olympia. Gevers showed the importance of slightly restraining a potentially hot horse when the energy in the arena can be contagious. Gevers executed solid changes and nice transitions, with a fabulous half pass. Rounding out the top 10 at Olympia were Katherine Bateson Chandler of the USA and Marie Emilie Bretenoux of France. The London competition this week marks the fifth of nine legs leading to the finals, with the next leg being held in Amsterdam in January. 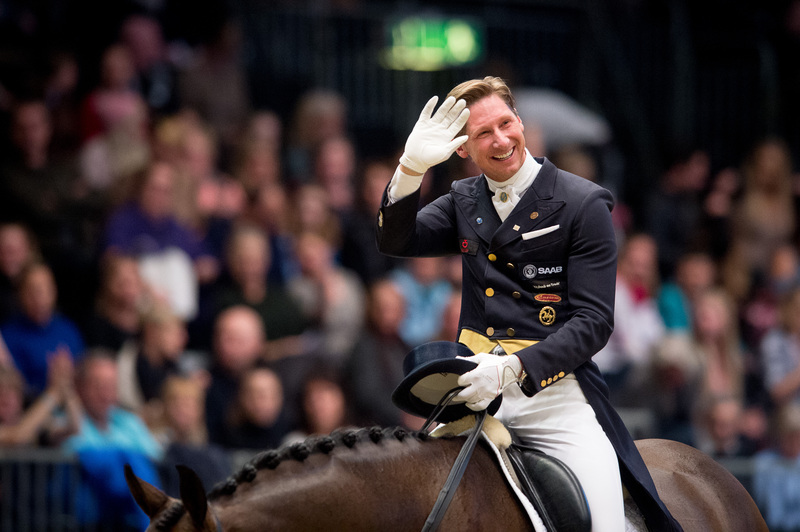 After Olympia, Kittel leads the standings with 74 points, followed by Dorothee Schneider of Germany (55 points). In a tie for third place are Morgan Barbançon Mestre of Spain and Jessica von Bredow-Werndl of Germany, each with 42 points. With the high calibre of riders this season and each nation only allowed three spots in Paris – with one already guaranteed to defending champion Isabell Werth – the competition will be tight to see who will ride in Paris.